This 30" x 120" TableTop King CB-SS-3010 enclosed base work table combines a durable work surface with concealed storage to keep mixing bowls, containers, prep supplies or even small kitchen appliances close at hand! It features a heavy duty 14 gauge type 304 stainless steel top, with an 18 gauge type 430 stainless steel body for lasting durability. Six stainless steel legs and matching bullet feet ensure maximum stability. A fixed midshelf is included to promote even more storage flexibility. 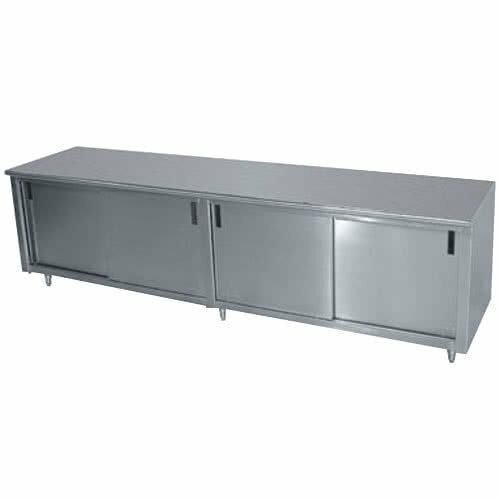 Built to stand tough against the rigid demands of the busiest kitchens!